Updated Tuesday April 23, 2019. *** This tutorial was updated today to show you exactly how to install the newest version of Kodi: Kodi 17.3 Krypton. 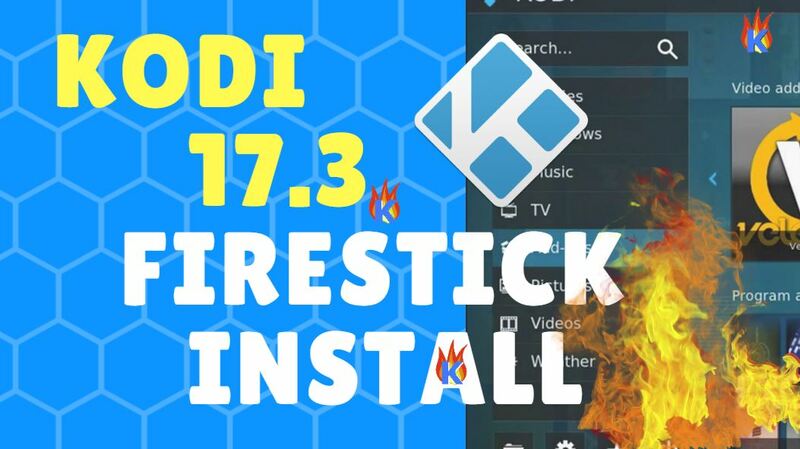 Use this install guide to install Kodi 17.3 FireStick (yes – the new Kodi v17.3) in about 10 mins or less. The Latest and LAST Kodi Krypton (17.6) RELEASED! Get the latest and LAST version of Kodi Krypton right now at http://kodifiretvstick.com/kodi-v176-install-update/ and learn some tricks toward making future updates to Kodi on Android devices EXTREMELY EASY as well! Kodi 17.3 was released May 25th, 2017. Kodi (v17.3) is the latest version of Kodi, which contains important security fixes that fix an issue that made it possible to hack Kodi 17.0 or 17.1 using malicious subtitle files. To continue watching streaming & TV Addons with Kodi, you now need to upgrade to Kodi 17.3 from any other (previous) Kodi version (see the directions below). Why is this mandatory to upgrade Kodi? Kodi’s sources are moving to HTTPS (for your information safety). The HTTPS protocol is only supported by Kodi 17.1 and later, future versions (such as Kodi 17.2 and 17.3 +). Now that Kodi 17.3 Firestick Official is released, Team Kodi conveniently made a short download link for us. This link lets us easily download and Install Kodi 17 FireStick (& Fire TV). To install Kodi 17 Krypton on Fire TV or Fire Stick, simply add the “Downloader” App to your Firestick. Then use Downloader to download the Kodi 17.3 apk file so you can start streaming now! Kodi 17.3 Security Warning: After the release of Kodi 17.3 FireStick, users in UK and US are reporting receiving DMCA letters. As a Kodi user myself, I protect my streaming data with a secure VPN so I don’t receive DMCA threat letters in the mail. After you install Kodi 17.3 on FireStick, I strongly suggest you do the same and use my coupon code FIRETV25 to take 60% off a 1 Year subscription. Then just use my VPN setup videos & written guides to set up your VPN on all your devices, including Amazon FireStick. Using your FireStick / Fire TV, go to the Home screen by pressing the Home button on the Fire TV remote. Enable ADB Debugging on your Fire TV by going to the System / Settings area. Make sure ADB Debugging is Enabled and Apps From Unknown Sources are both enabled, because Kodi requires that both of these are turned on to install. In the Downloader app, Enter “http://bit.ly/kodi173arm” without the quotes. The link above is the shortlink to direct download the Kodi 17.3 (“Krypton”) Official Release (released Feb 5th, 2017). Alternatively, to install Kodi 17 Krypton on other devices, check out our install Kodi on Android or other Kodi install guides. Previously, we could enter “http://bit.ly/kodi161arm” to install Kodi on Fire Stick, which is short for “Kodi 16.1 ARM version”. But Kodi 16 Jarvis is no longer supported, so don’t use it. For Kodi Release Candidate 3 FireStick installer file (“apk file”), enter http://bit.ly/kodi17rc3. Wait for the Kodi download to complete. If the Downloader app doesn’t launch the Kodi installer for you, then select “Open File“. After the Kodi installer launches, your Fire TV should ask if you’d like to “Install” or “Cancel”. Select “Install“. Psst.. the long-awaited Firestick VPN app is now available! Don’t forget the last step of the process above! Why? Because the last step of the Kodi install process sets up TV Addons on your device and protects your streams by using automated encryption. Use my Kodi VPN YouTube video to set this up in just a few minutes on FireStick, Android, iPhone, PC or any other device. If you see an error when you launch Kodi after the initial install (specifically an error that says “Cannot download OBB“), then try to re-start Kodi until the error no longer appears. Sorry about the audio in the tutorial above – YouTube’s video editor made it sound like crap! I’ll re-do it soon. Use the steps in the video above to install TV Addons in Kodi Krypton using the Kodi 17 Config Wizard (which is now called the Indigo Wizard). Using your Android TV Box, go to the Home screen by pressing the Home button on your Android TV Box’s remote. Select the Kodi icon to launch Kodi! Now launch apps2fire on your Android smartphone or tablet. At this point, you need to switch over to your Fire TV stick to get its IP address. Using your FireStick remote, go to “Settings” from the Fire TV home screen. Then select “System“. Now, enter the IP address you see on your FireStick screen (under “IP Address:”) into the “Connect” tab of the apps2fire app on your Android phone. After apps2fire has connected to your FireStick, go to the “Local Apps” tab. Then press “Install on ______“, where the “____” is the IP address of your FireStick or the name of the device. Wait a few minutes for apps2fire to install Kodi on FireStick by sideloading (copying from another Android device). Select Kodi to launch Kodi! Improved media playback throughout Kodi in Kodi 17Note: Kodi 17 Krypton is WAY better than Kodi 17 Jarvis, so you should definitely download Kodi 17 Krypton and install that BEAST. Installing Kodi 17 is just like installing Kodi 16 Jarvis. Kodi download link not working? The changes brought by Kodi 17.3 are centered around a security vulnerability that existed with Kodi subtitle files (.srt files). Essentially, a malicious person could upload malicious code to the OpenSubtitles.org site – then put .srt files in with a movie that point to the malicious files. So, Kodi 17.3 is a security improvement for you – the Kodi end user. Just a few days before Kodi 17.3 was released, Kodi 17.2 was released (May 21st). 17.2 is simply 17.3 without the bug fixes. 17.3 does contain the Kodi subtitle security fix. Kodi 17.1 adds HTTPS support for Kodi, which makes our streaming more secure! Kodi 17.1 was released April 2nd, 2017. Before that, Kodi 17.0 came out on February 5th, 2017. I just checked the email accounts and didn’t see an email from you, unless I already replied and didn’t see your name in the address. Feel free to send an email to kfiretvcontact@gmail.com. I’ll be replying to all emails sent to this address within 24 hours from now on. To try to answer your question, I recommend you try an alternate install method.